The manga creator is Huang Jin Zhou. Google Trends: Ranks slightly lower than Twelve Kingdoms and a lot lower than Fushigi Yuugi. Countries of Popularity: Canada, United States, France, Brazil and Spain. Synopsis: Evil General Keiro and his partner in crime Shimei plot to usurp the imperial throne and unleash an army of the undead upon the world. Only young Taito Shirei and the Five Divine Warriors have the power to stop Keiro and restore peace to the kingdom. While the protagonist and his friends travel to the imperial capital to rescue the emperor and defeat Keiro, they embark on many adventures that leave lasting impressions. Story/Direction: The story is told in a similar fashion to wuxia (Chinese martial arts adventure) literature. You will find formulaic wuxia elements like chivalrous protagonists, martial arts temples/sects, wandering heroes and fantasy elements. The plot is evenly paced and there are few episodes that could be considered as fillers. Viewers will either really hate the story or really enjoy it. Animation: The visuals in Hero Tales are adequate enough not to be a distraction. Many of the fighting scenes are well animated and have an epic feel to it. Since the setting is in ancient China, the series is animated to capture the oriental feel. Music: This is one of Hero Tales' biggest strengths. The background music does an excellent job recreating the atmosphere of ancient China. The opening and ending songs are very good as well. My Favorite Character: Koei. She is the master of Kosei, who is one of the Five Divine Warriors. Although her appearance is limited to a few episodes, Koei is definitely the most likable character in the show. Her ending is tragic however. 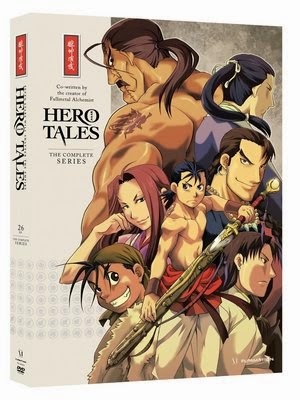 Final Comment: Hero Tales was expected to be the next anime hit after Naruto and Bleach. Unfortunately, otakus despise this series criticizing it for its generic plot and lackluster animation -- the latter with which I disagree. I guess I don't watch anime frequently enough to share their distaste for shows like this. If you watch Hero purely for entertainment, you will enjoy it better.